The mixed reality (MR) technology, which refers to the incorporation of virtual reality and augmented reality principles to develop immersive virtual environments, is witnessing a vast rise in applications across a number of industries. Sectors demanding more of the technology across a variety of applications include entertainment, sports, healthcare, education, navigation, and travel. In the near future, the technology is expected to benefit from more focus of companies developing more natural interfaces, significant rise in investment in the field of Internet of Things, and the constant rise in the number of market participants. Rising applications of the technology in the automotive and aerospace sectors are also expected to open up lucrative growth opportunities for developers of mixed reality systems. Transparency Market Research estimates that the market will expand at an exponential 39.1% CAGR from 2016 to 2024, rising from US$35.30 mn in 2015 to an opportunity of US$1.2 bn by 2024. Of the key applications of the mixed reality technology, the report examines those across industries such as healthcare, e-commerce and retail, automotive and aerospace, and entertainment. Of these, applications across the entertainment industry are expected to prove to be the most promising for the global mixed reality market over the report’s forecast period. Mixed reality principles are finding significant usage in developing immersive experiences in the entertainment sector and the trend is expected to remain strong over the next few years as well. Moreover, the increased usage of the augmented reality technology for video games is also expected to fuel the demand for mixed reality solutions and devices in the near future. The entertainment application sector is expected to exhibit a massive 40% CAGR over the report’s forecast period, holding on to its top spot in the next few years as well. From a geographical standpoint, the report covers the mixed reality market across regions such as Asia Pacific, Europe, North America, and Rest of the World. Presently, the market in North America is the leading contributor if revenue to the global market and is expected to remain a leading force over the report’s forecast period. The North America mixed reality market is expected to exhibit a huge 41.9% CAGR over the report’s forecast period, cashing-in from vast applications in the region’s massive entertainment industry and the presence of some of the world’s leading graphics companies. Rising production of 3D movies in the region will also accentuate the overall growth of the mixed reality market. 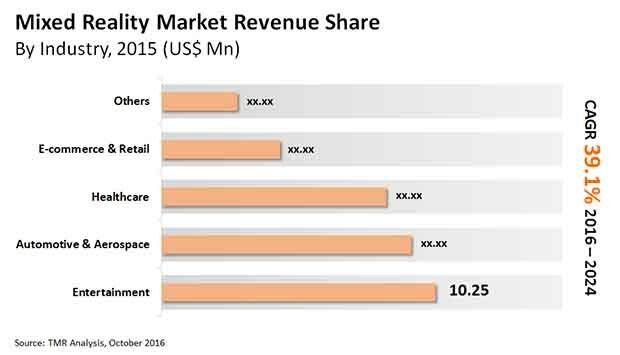 The Asia Pacific region is also expected to present vast growth avenues for the mixed reality market in the next few years, trailing the North America market in terms of revenue contribution to the global market. The promising growth prospects of the Asia Pacific augmented reality market can be attributed to the rising adoption of smart computing devices such as smartphones in several developing economies in the region. Steady introduction and adoption of IoT across a number of application areas in the region is also expected to accentuate the growth prospects of the Asia Pacific mixed reality market in the next few years. Some of the leading companies operating in the global mixed reality market are HTC Corporation, Daqri LLC., Samsung Electronics Co, Ltd., Microsoft Corporation, Seiko Epson Corporation, Canon Inc., Magic Leap, Inc., Facebook Inc., Meta Company, Infinity Augmented Reality, Inc., and Recon Instruments, Inc. Substantial advances in hardware technologies and the adoption of sophisticated mobile software to create real-time and immersive environments are the key factors stimulating the demand for mixed reality (MR). The inroads made by virtual world of computer-generated imagery to real-world environments along with the advancement in automated reality technologies has led to the steady evolution of the MR market. The MR market has witnessed the continual penetration of head mounted display (HMD) devices in a variety of areas such as in gaming, sports, entertainment, and healthcare industries. A large number of companies are actively focused on developing high-end augmented reality applications for these industries that is expected to positively impact the market in the coming years. The global mixed reality market is anticipated to rise at 39.1% CAGR from 2016 to 2024 and attain a valuation of US$1.2 bn by the end of forecast period. The report offers an in-depth insight into the current and emerging trends, technological advances, market share and size of various component and application segments. The study is prepared with the help of extensive primary and secondary researchers include valuable inputs from a wide range of market participants such as industry experts, strategists, market leaders, and business executives. The research study takes a closer look at recent disruptive technologies and assesses their impact on the competitive landscape of major regions. The insights and analysis help stakeholders gain a better understanding of the market and enable them to devise impactful strategy. The mixed reality market is primarily driven by its increasing application in gaming and entertainment industries. The convergence of augmented reality and virtual reality technologies has led to the development of a host of interactive content in gaming industry. As a result of numerous transformative gaming effects of mixed reality technologies, an increasing number of video gaming companies are becoming a part of ecosystem of the mixed reality market, thereby boosting the market. Furthermore, growing popularity of IoT and wearable technologies are expected to expand the horizon of mixed reality applications. The soaring demand for mixed reality applications in healthcare and medical industries facilitates better diagnosis and treatment of diseases. The increasing adoption of MR in imaging and radiology is expected to open up lucrative market avenues over the forecast period. Furthermore, the use of mixed reality applications bear large-scale implications for online shopping which is expected to confer enormous benefits to several companies in e-commerce and retail industries. Regionally, the global mixed reality market can be segmented into North America, Europe, Asia Pacific, South America, and the Middle East and Africa. Among these regions, North America is expected to lead the global market for mixed reality. The growing popularity of 3D movies in entertainment industry is anticipated to bolster the demand for mixed reality hardware and solutions. North America is anticipated to be followed by the Asia Pacific market. The steady growth of this regional market is expected to be fuelled by increasing adoption of mixed reality applications across various industries and a robust uptake of smart wearable devices among consumers. In addition, the adoption of mixed reality solutions has transformed the interactive experience of viewers spurring the demand for these solution in developing and developed nations in the region. Prominent companies vying for a sustained share of the mixed reality market include Daqri LLC., Epson, Facebook Inc., Samsung Electronics Co, Ltd., HTC Corporation., Recon Instruments, Magic Leap, Inc., Microsoft Corporation, Canon Inc., and Infinity Augmented Reality, Inc. Leading vendors are launching high-end mixed reality solutions that offer immersive and interactive experiences in end-users industries to consolidate their market positions.